The mainstay of GraphiTech�s CAD/CAM products, Cimagraphi provides creative freedom in embossing, engraving, and milling capabilities to ensure the production of detailed and intricate 3d digitizing & designs. Cimagraphi can be used in a wide range of applications from small intricate pieces to industrial applications - with precise accuracy assured. State of the art designer and milling tools enable the freedom to produce 2D or 3D models and parts, either by embossing, engraving, or any other procedure for the artistic crafts. 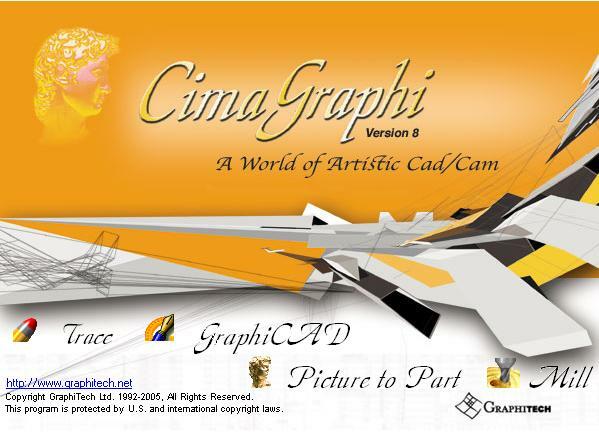 Cimagraphi provides connectivity to most industry Cad-Cam standards such as: DXF, IGES, STEP, VDAFS, 3DM, STL/SLA.